The Nigerian Air Force (NAF), in its resolve to promote innovation and enhance its Intelligence, Surveillance and Reconnaissance (ISR) capabilities, today, 15 February 2018, inducted its first indigenous operational Unmanned Aerial Vehicle (UAV) nicknamed Tsaigumi. The Tsaigumi UAV, which was produced by NAF Aerospace Engineers in collaboration with UAVision of Portugal, would be used for ISR operations in land and sea domains. It could also be used for policing operations, disaster management, convoy protection, maritime patrol, pipeline and power line monitoring as well as mapping and border patrol duties. In addition, it could be deployed for the protection of wildlife, weather forecast and telecast. In his remarks at the induction ceremony, the Special Guest of Honour, President Muhammadu Buhari, praised the leadership of the NAF, under Air Marshal Sadique Abubakar, for the unprecedented feat it had attained in Research and Development (R&D). According to President Buhari, the drive, determination and unwavering support of the NAF leadership brought about numerous significant innovations, not least of which is the Tsaigumi UAV. He added that the attainment of the technological feat is an indication that Nigeria has the needed potential to surmount other technological needs. The President noted that UAVs are an essential feature of modern armed forces. He therefore considered it most gratifying that the NAF had gone a step further than simply acquiring them, to developing UAV capabilities with indigenous technology. “Indeed, this outstanding accomplishment holds promise of both military and economic benefits to the nation. From the military perspective, the added capacity for ISR provided by Tsaigumi UAV would undoubtedly boost ongoing and future security operations”, the President added. The President noted that as soon as the NAF UAV project moves into the next stage of mass production, it would create employment opportunities and generate revenue as Nigeria’s first military export product. He therefore commended the NAF for the accomplishment and urged it not to rest on its oars but to strive harder in its R&D efforts for greater innovation. President Buhari then promised his administration’s support towards the attainment of greater technological milestones for the nation. In his welcome address, the Chief of the Air Staff (CAS), Air Marshal Sadique Abubakar reiterated the commitment of the NAF to R&D so as to develop unprecedented capacity to surmount current and emerging security challenges. 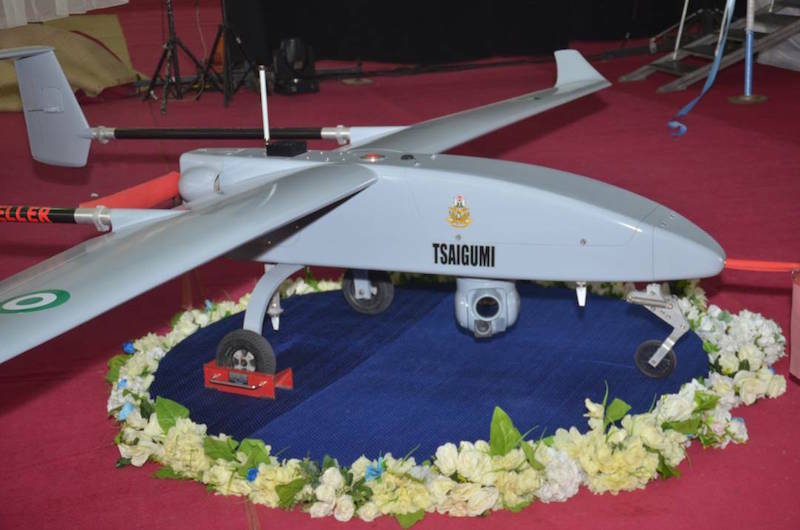 The CAS explained that the newly produced Tsaigumi UAV possesses certain salient physical and performance parameters, which position it as an efficient tool for curbing Internal Security challenges. The CAS posited that history and modern experience attest to the role of the military in bringing about innovations that have revolutionized not just warfare capability but human capacity as a whole. “Indeed, many of the technologies that enhance human life and safety today emerged from R&D; radar, jet engines, satellite tracking, digital photography, Internet and others”, the CAS added. According to the CAS, today’s feat would have been impossible if not for the unflinching financial support that the Service has continued to receive from the Federal Government. Air Marshal Abubakar added that the NAF would not rest on its oars regarding R&D. Accordingly, having achieved enhanced ISR capability, the next step for the NAF is to perfect the development of another UAV nicknamed “Ichoku”, which would be the first indigenous Unmanned Combat Aerial Vehicle (UCAV). The President who was highly impressed with the innovation later unveiled the UAV to the delight of invited guests. He was thereafter led on a guided tour of other recent and ongoing NAF R&D projects, which were on display. The projects included the Mi-Helicopter Gunship’s Hydraulic Accumulator Diaphragm, SB Abubakar Aviation Power Pack, Unmanned Ground Vehicle and F4 Rocket Launcher Heat Shield Cone. Also on display was NAFSA Eagle Aircraft, an 8-passenger multi role aircraft that was locally designed and being manufactured at the Air Force Research and Development Centre to fulfil a variety of roles in the NAF. It would be recalled that the NAF overtime has developed the capacity of its personnel across different facets of aerospace engineering. These trained engineers in collaboration with other organizations and institutions, both home and abroad, have worked assiduously to improve NAF operations through design, development and innovation. It is through these efforts that the NAF aerospace engineers successfully produced the indigenous operational Tsaigumi UAV. Tsaigumi UAV is a much more advanced and operationalized version of the earlier produced Amebo and Gulma UAV prototypes. The event was witnessed by several senior government officials and political leaders, one of who was His Excellency, Mallam Nasir El-Rufai, the Executive Governor of Kaduna State. Governor El-Rufai immediately expressed the willingness and readiness of Kaduna State to procure some Tsaigumi UAV from the NAF, once available.